The Fjordhus Reivers 5s line-up. 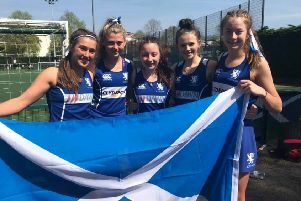 A howling wind at Tweedbank proved to be the biggest challenge for Fjordhus Reivers hockey 5s against Falkirk and Linlithgow Development Team. The 5s dominated for the entire game, as reflected by the 6-0 final scoreline. With the blustery conditions, communication on the pitch was difficult and Reivers struggled to find their usual work rate and composure. Janet Jack led by example and her skill and experience encouraged the players to settle into their game. Sustained, attacking pressure on the opponents goal resulted in Reivers winning numerous penalty corners and, from this, cracking goals resulted from Jessica Main, Rebecca Anderson, Janet Jack and a hat-trick from Kacey Edmison. Thanks were conveyed to Emma Pate and David Johnstone, for umpiring, and to all the supporters who braved the windy conditions to cheer the team on.